Blue Door Veterinary Services is a veterinary practice like you have never seen before! 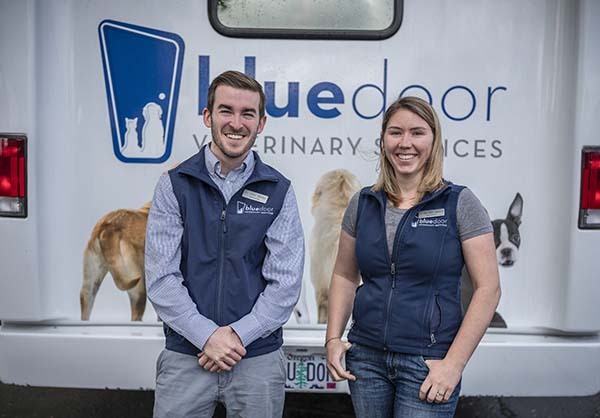 Dr. Meridith Dawson, our owner and veterinarian, operates our mobile veterinary unit in the greater Portland community, providing complete veterinary services to her patients. Our mobile vet hospital is equipped with a complete surgical suite, x-ray suite, pet dental treatment suite, and so much more. Our advanced technology is on par with the technology you would find in a traditional brick and mortar practice, but we come right to your door! In some emergency situations, we may be able to provide pet ambulance service, helping you to transport your pet to an emergency hospital where they can receive longer-term/ICU treatment. We invite you to explore the many veterinary services we offer to learn more about who we are and what we can provide to you, with exceptional convenience! If you have questions about our care, please explore our Frequently Asked Questions page, or contact our team directly.